One of my favorite works by Hopper is in this show. 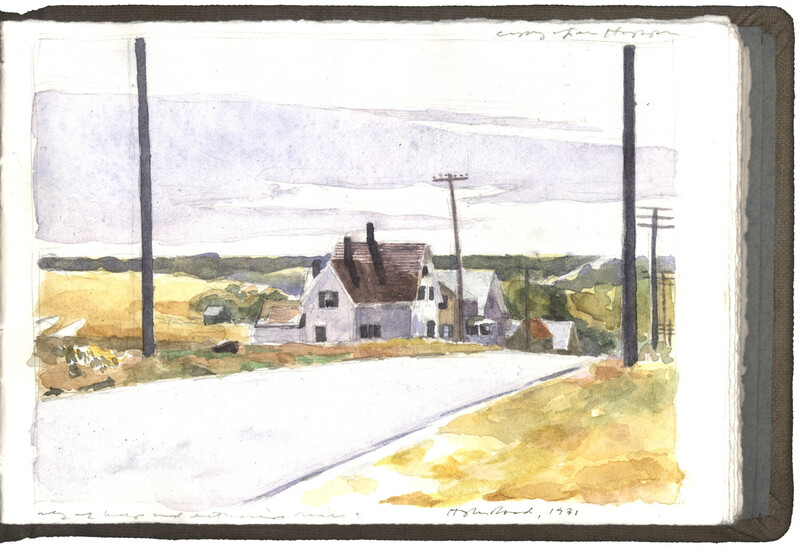 High Road, 1931, a very large watercolor. It spreads out and is very empty with few visual events immediately apparent. The overall effect is openness and light only the the deep shadows of chimneys, and the stark verticals of telephone poles widely spaced in the composition. The road in the foreground balances another road in the distance. Is this a broken single road? Regardless; the effect carries the viewer out out into a vast, planetary space. It is as if Hopper lifts up the horizon to show a great continent with bays and estuaries in the sky. The blue peninsula of Emily Dickinson’s poem 132 “It might be easier.” Unlike Hopper’s contemporary Charles Burchfield, Hopper never uses the moon or sun as a motif to imply the cosmic. His more subtle approach is never clearer to me than in this work. Link to Edward Hopper’s High Road.